North Carolina is the ninth-most populous state in the country. Millions of parents in the Tar Heel state have to decide where to raise families. Should they go to Charlotte, a bustling city with the third-largest banking sector in the country? Or head west to live near the Great Smoky Mountains? Below we look at factors like housing affordability and job opportunity to find the best places in North Carolina to raise a family. Moving to North Carolina? Check out local mortgage rates. In order to find the best places to raise a family in North Carolina, we looked at data on 10 factors. We analyzed data on median home values, violent and property crime rates, unemployment rates, housing costs, percent of families in poverty, high school graduation rate, percent of residents under the age of 20, median household income and 5-year change in home values. Best places come at a cost – If you want to raise your family in one of the best places in North Carolina, you’ll likely need to spend. Across our top 10 cities, the average cost of childcare and housing runs over $2,000 per month combined. Raleigh ‘burbs – Our top 5 cities to raise a family are centered around Raleigh. This state capital offers stable employment with potential for high incomes. Charlotte suburbs also scored well and fill out the bottom half of the top 10. Which big city? – If you want to live in the center of the action, Greensboro may be the best option. Greensboro is the third-largest city in North Carolina and ranked 18th in this study. Charlotte and Raleigh, the largest and second-largest cities, ranked 26th and 20th, respectively. Holly Springs is a town of about 29,000 people located in Wake County. Our data suggests that Holly Springs is one of the most economically prosperous places in North Carolina. The median household earns over $94,000 per year. Plus, only 1.8% of families are living in poverty. Holly Springs also has the second-lowest unemployment rate in our study. The only concern might be affordability. Paying for the median Holly Springs home costs just under $1,500 per month, the most in our study. Apex, a large suburb of Raleigh, takes second. This is a very safe place to raise a family. This city ranks fourth and fifth in property crime rate and violent crime rate, respectively. Another plus are the jobs one can find around Apex. This city has the 10th-lowest unemployment rate and the average household earns over $90,000 per year. However, living in Apex can be pricey. Wake County, where Apex is located, has some of the highest costs of childcare in the state of North Carolina. Additionally, the average home costs just under $1,400 per month. Morrisville, another city in Wake County, looks quite a bit like the two cities ranked above it. Economic prospects are good here. The city ranks third in average household income and fourth in unemployment. It also ranks third in percent of families living in poverty. One area Morrisville does not score as well in is the percent of children who live in the area. Only 29% of residents in this city are under the age of 20. That’s the fifth-worst score in the top 10. Just north of Raleigh sits Wake Forest, the original home of Wake Forest University. This city took fourth thanks to a young population and high median household income. Around 34% of residents here are under the age of 20, and the average household earns over $80,000 per year. In both metrics Wake Forest secures top 10 scores. Like other cities near the top of the list, the cost of living can be high in Wake Forest. Data from the Census Bureau shows the median home costs over $1,300 per month. Cary is the biggest city in our top 10. In the past, Cary has competed for the title of safest city in the United States. That safety is one reason Cary is a great place to raise a family. According to our data, Cary has the second-lowest property crime rate and the lowest violent crime rate in the study. But Cary is more than just a safe place to raise a family. Its economic prospects are promising. This city has the lowest unemployment rate (4.5%) and second-highest median household income ($91,579) in the study. Huntersville is the sixth-best place to raise a family in North Carolina. Local attractions include Lake Norman, a man-made lake, and the annual Carolina Renaissance Festival, which is held every year. Huntersville scored well in family poverty rate (only 3.2% of families are under the poverty line) and median household income (the average household earns over $90,000 per year). 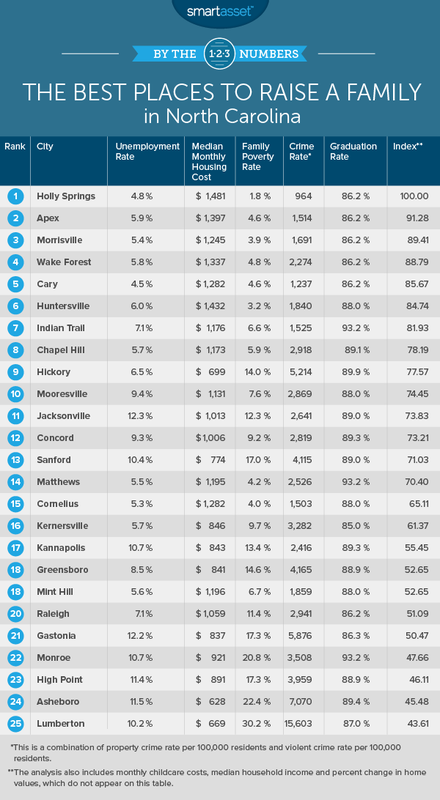 In both of those metrics, Huntersville ranked in the top five. The area can be pricey, however. Our data shows that the median home costs over $1,400 per month and monthly childcare costs are just under $800. Indian Trail is a suburban town located outside of Charlotte. It got its unique name due to its placement along the trading route called the Indian Trail. This is one of the best cities in North Carolina for the younger generation. The high school graduation rate around Indian Trail is over 93%. Plus, around 35% of the population is under the age of 20, meaning there should be plenty of opportunities for kids to make friends. Chapel Hill takes eighth. 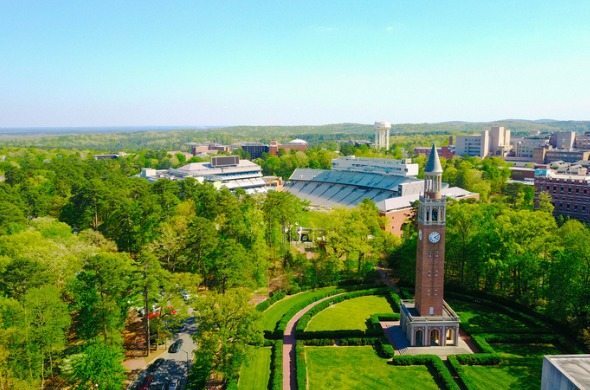 This university town is best known for being the home of the University of North Carolina at Chapel Hill. The university provides stable employment to local residents. Plus, Chapel Hill is part of the Research Triangle which offers high-paying STEM jobs to residents. Overall Chapel Hill has the seventh-lowest unemployment rate and the average household earns over $60,000 per year. Homes are also slightly more affordable than in other top 10 cities. The average house costs just over $1,150 per month. Hickory is your best option if you want to maximize affordability. The average home here costs roughly $700 per month. Another plus is the local education system. Our data shows that high schools around Hickory have a graduation rate of 89%. That’s a top 10 rate in that metric. One concern might be the slightly older population. Only about 26% of the Hickory population is under the age of 20. Mooresville is the largest town in Iredell County and is a great place to raise a family, especially if you’re a NASCAR fan. This city is the home to a few NASCAR racing teams and the Universal Technical Institute’s NASCAR Technical Institute. There are also non-NASCAR reasons to raise a family here. For one, this city has a fairly young population. About 31% of Mooresville residents are under the age of 20. Plus, only 7% of families find themselves under the poverty line, suggesting there are decent economic possibilities for most families in the area. Median home value. Data comes from the Census Bureau’s 2015 5-Year American Community Survey. Graduation rate. Data comes from the EDfacts data files provided by the U.S. Department of Education. Data is for the 2014-2015 school year and is measured at the county level. Percent of residents aged 19 or younger. Data comes from the Census Bureau’s 2015 5-Year American Community Survey. Median monthly housing costs. Data comes from the Census Bureau’s 2015 5-Year American Community Survey. Property crime rate per 100,000 residents. Data comes from the 2014 and 2015 FBI Uniform Crime Reporting database and local police departments and city websites. Violent crime rate per 100,000 residents. Data comes from the 2014 and 2015 FBI Uniform Crime Reporting database and local police departments and city websites. 5-year median home value change. This is the percent change in median home values from 2011 to 2015. Data comes from the Census Bureau’s 2015 and 2011 5-Year American Community Survey. Monthly childcare costs. This is the median monthly cost of caring for an infant. Data comes from the North Carolina Division of Child Development and Early Education. The cost of living in North Carolina is lower than the national average. This goes for both renters and homeowners. There are some places in North Carolina which can get pricey, however. Charlotte, for example, is more expensive than the rest of the state. But still the long-term costs of owning a home in North Carolina are relatively low. The average effective property tax rate in North Carolina is only 0.84%, 20th-lowest in the nation. If you bought a $250,000 home in Wake Forest, you could expect to pay $2,153 per year in property taxes. Of course, you have to buy your home before you pay your property taxes. To do that you will need a mortgage. Mortgage rates in North Carolina are a bit higher than the national average but there are some positive trends. From 2014 to 2015, the average mortgage rate in North Carolina dropped from 4.14% to 3.9%.